I recently decided, if not to retire my small hand*book journal, then to reserve it for drawings in wax pastel and/or gel pen on pasted papers. The roughness and absorbency of the hand*book’s paper (relative to the Daler-Rowney I’m used to) and its size (a tad too narrow: I prefer postcard size) have made it a disappointing purchase, and though I’ve been quite productive in it, I won’t be opting for a hand*book again. Just personal preference. 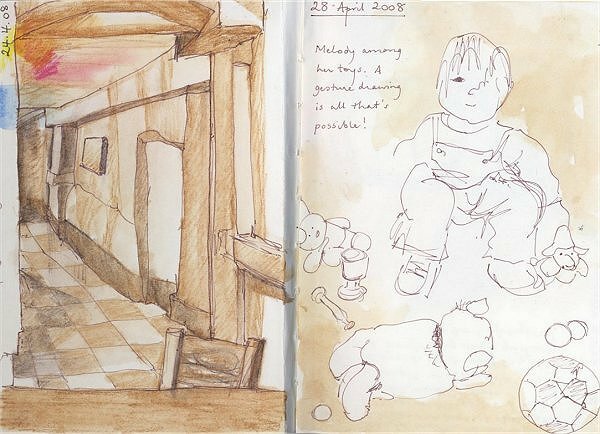 These 2 pages, then, are the first in a new 4×6″ Daler-Rowney: an interior view of a local coffee shop (EDM Challenge #128), and a rapid sketch of my daughter among her toys. I seem to have gone all sepia lately, but I can assure you it won’t last: I am too much a fool for colour! * Admittedly, this is only tenuously related to the content of my post, but it’s something I learnt while browsing on the topic of sepia (the brown ink so named having traditionally come from cuttlefish), and it surprised me. Cuttlefish aren’t fish. They’re molluscs. Yuk!…I stick those pens in my mouth too!Hmm, not sure who is worse off…them or me?Interested to read your thoughts on the HandBook E-J and delighted to see your nice loose sketches.You’d better get working in this book though ‘cos when that Canson arrives you just KNOW you are going to want to start it straight away.Have you decided on a May theme yet or are you not going with a theme? Your blog is now educational as well as artistic! Great, loose sketches.Are you doing the EDM challenge? I think I’ll give it a go again this year…I actually managed to do it last year!